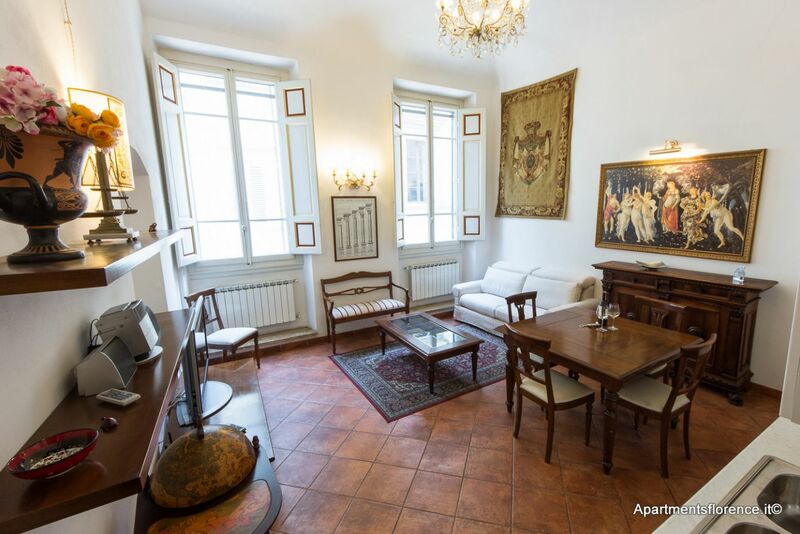 Elegant and charming location only a few steps away from the Duomo. 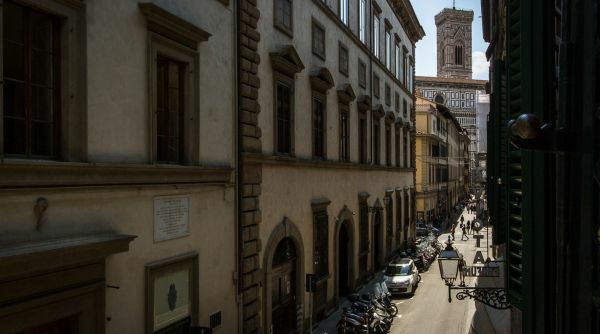 Where Florentine tradition meets modern comfort. 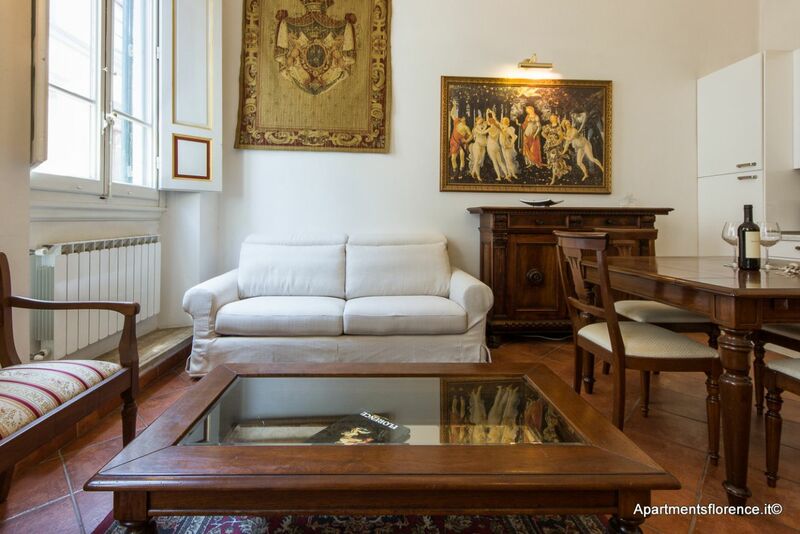 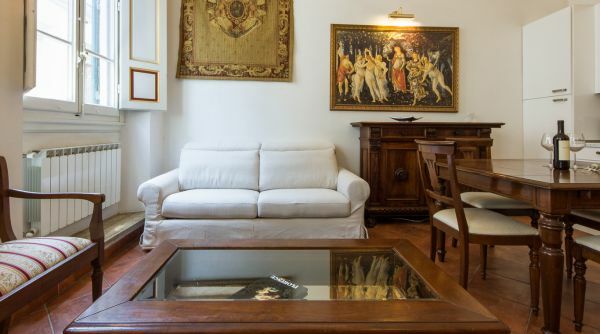 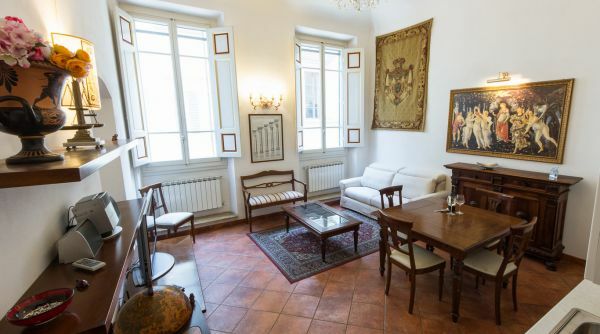 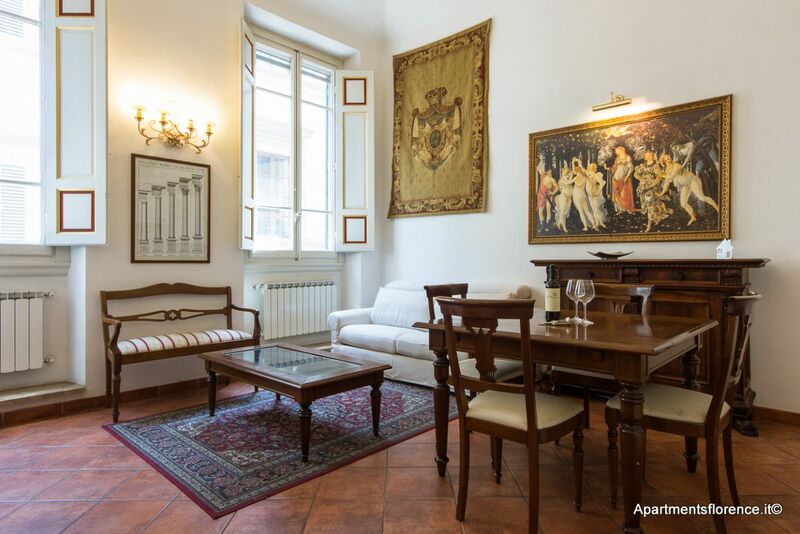 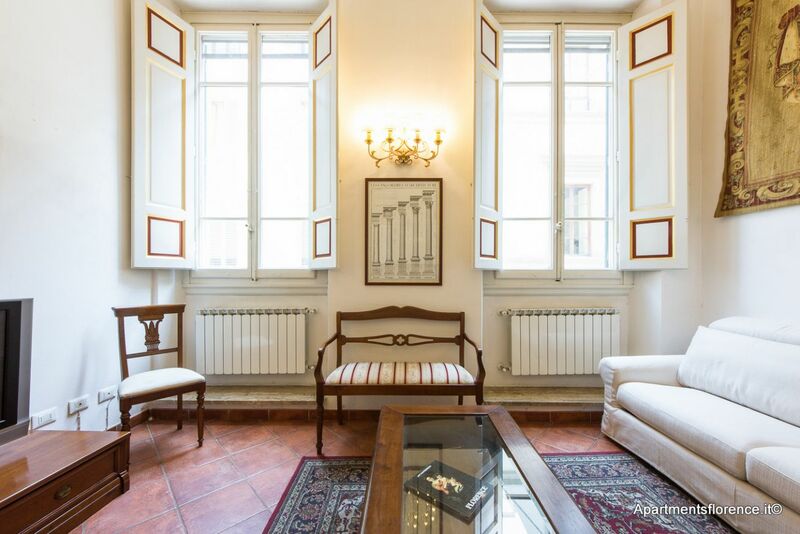 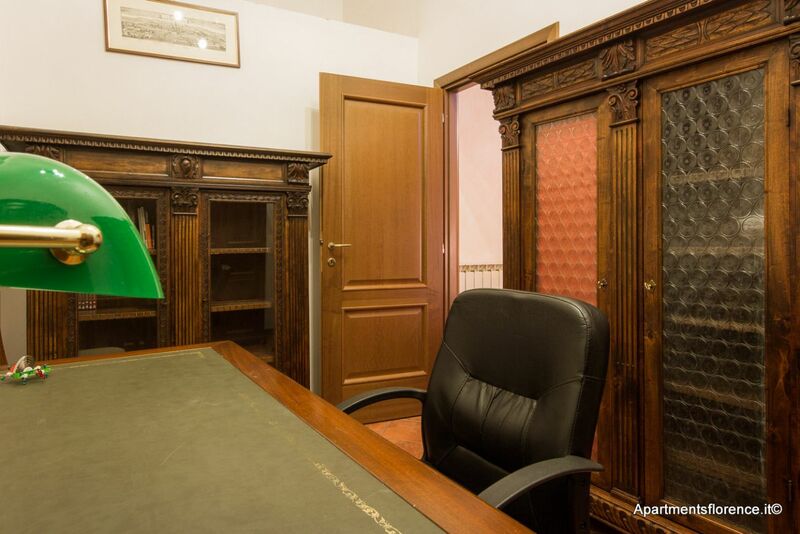 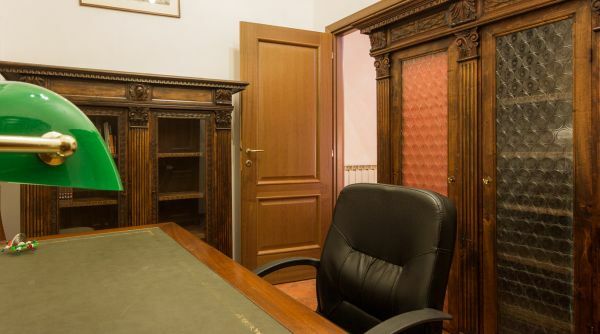 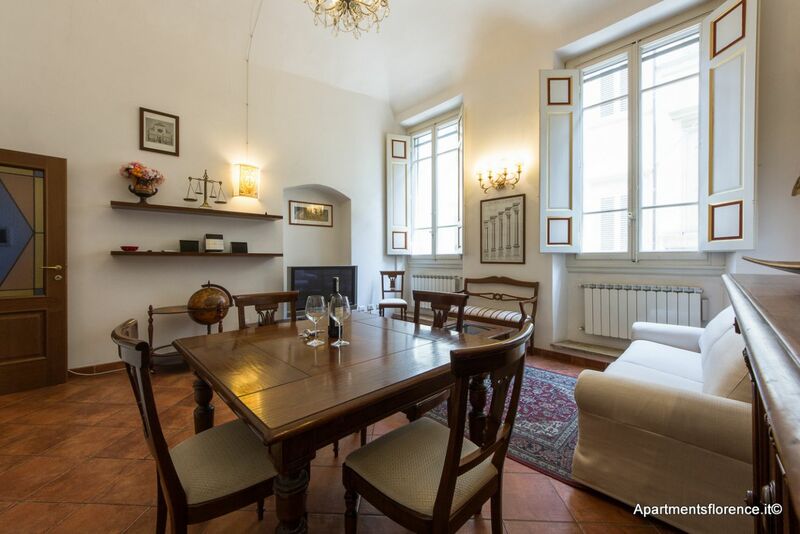 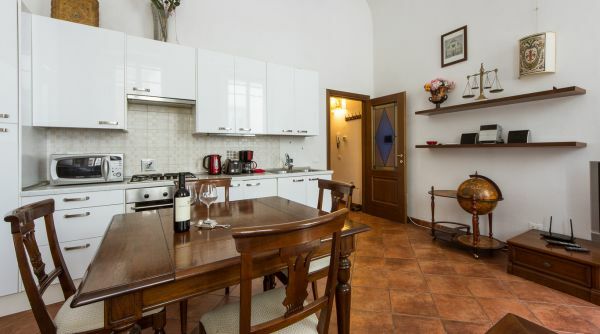 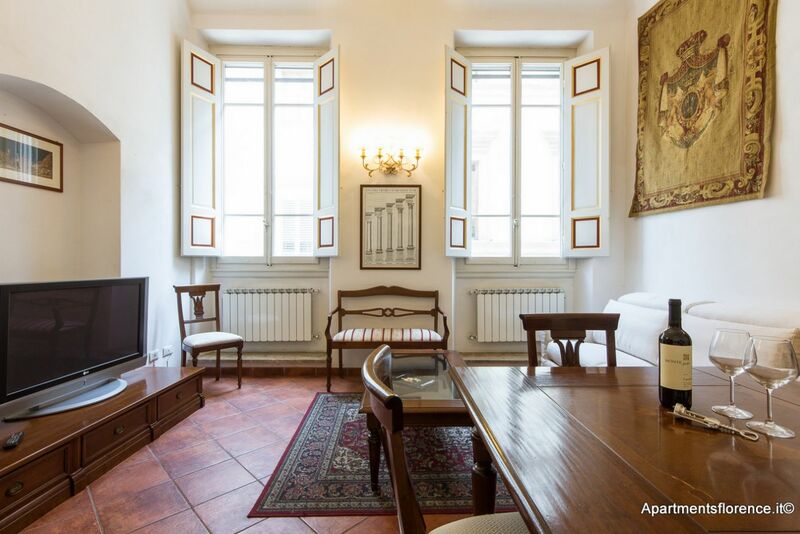 This apartment is located on the second floor (first european) of an elegant building set on Via Ricasoli, famous and lively street just around the corner from Piazza Duomo. 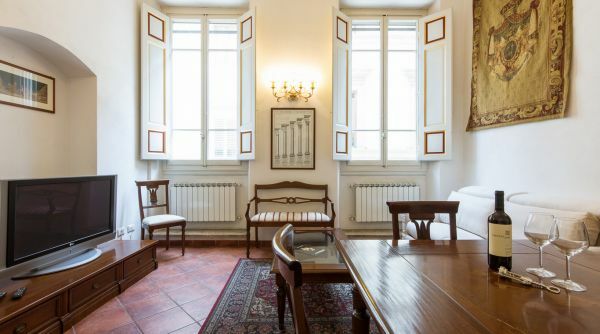 A recent renovation combined traditional Florentine refinement with modern amenities, creating a charming, elegant atmosphere. 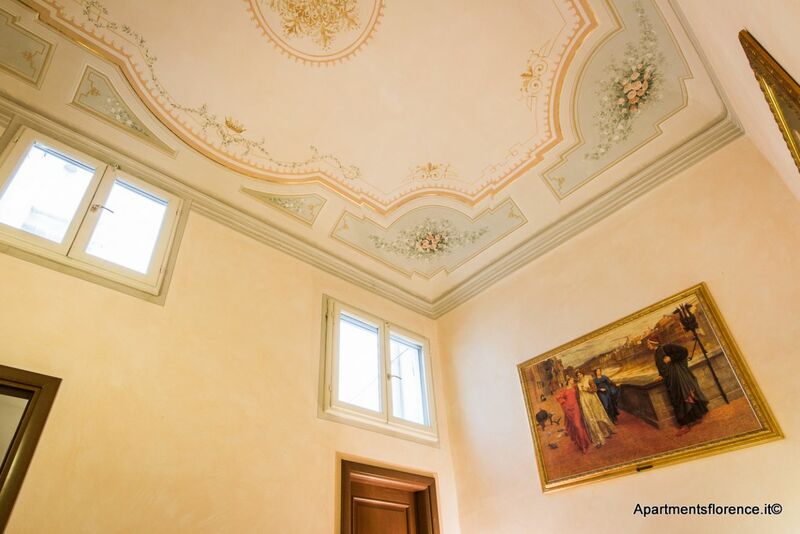 Every room radiates with natural light thanks to the large windows and the high ceilings, decorated with finely restored original frescoes. 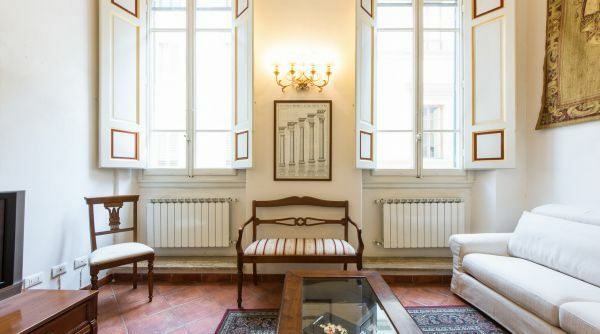 Terracotta floorings and antique interior design touches create a warm and welcoming feel throughout. 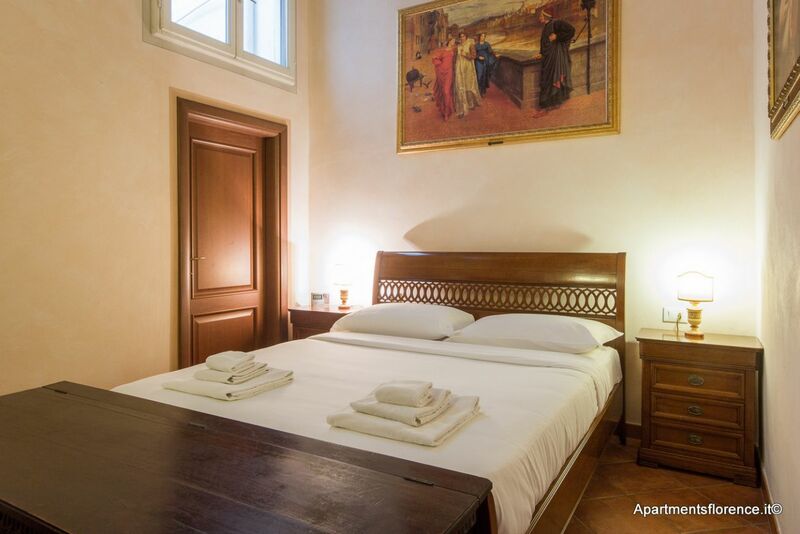 The apartment can accommodate up to four guests thanks to the double bedroom and the double sofa bed. 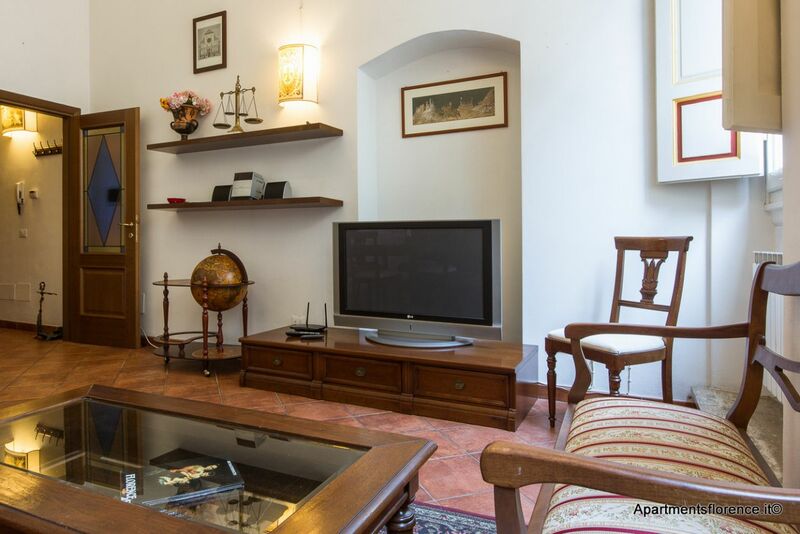 The spacious and airy living area, very bright thanks to the two windows, is equipped with a modern and fully stocked kitchenette, dining table and a rlax area with a comfortable sofa bed and flat screen TV. 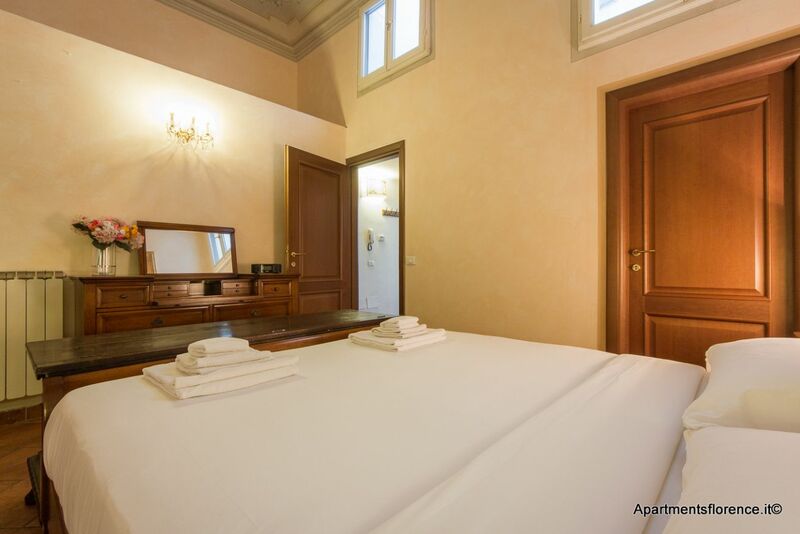 From the windows you will be able to admire a lovely view of Giotto's Bell Tower. 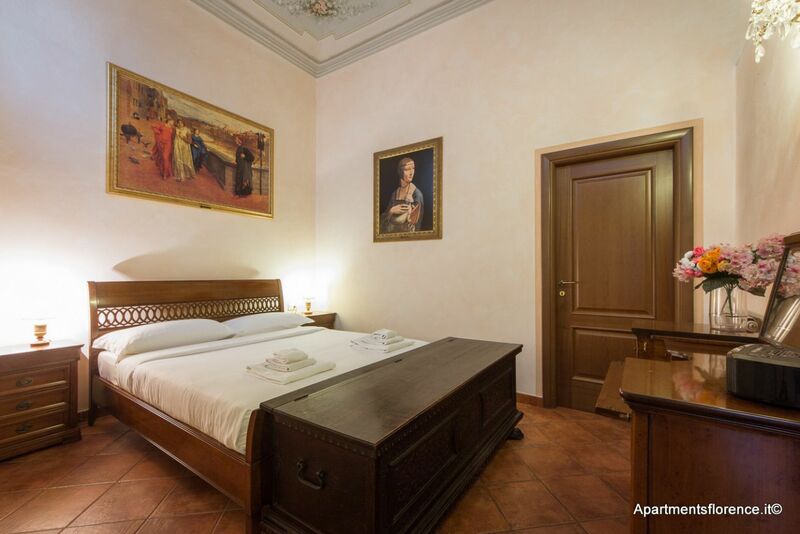 The master bedroom is very refined and luminous, featuring a queen size bed, night tables an antique ottoman and a lovely dressing table. 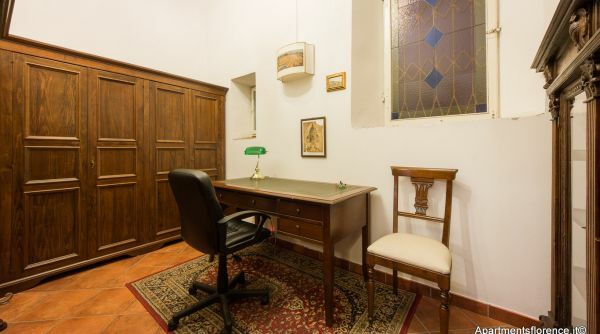 This bedroom has access to a private bathroom with shower, and also to a charming studio with desk and built-in closets, for extra storage room. 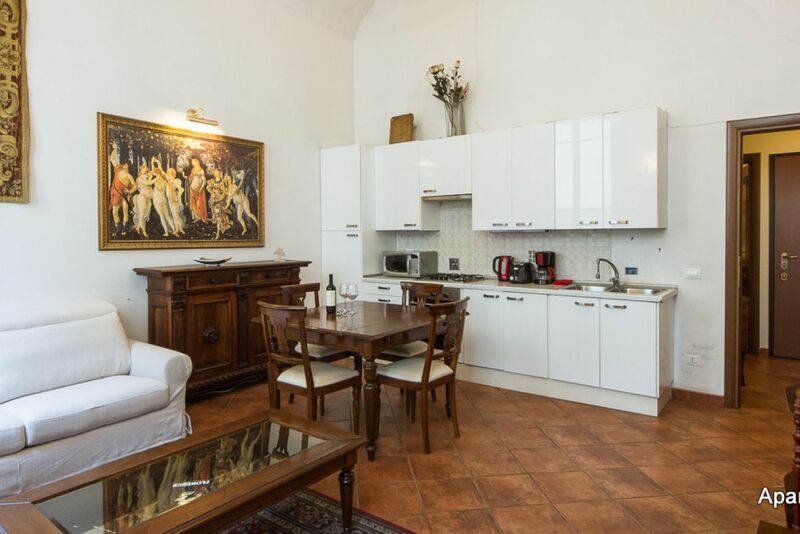 This apartment is the ideal choice for a couple, a family or a group of friends looking for an elegant and comfortable apartment in the heart of Florence. 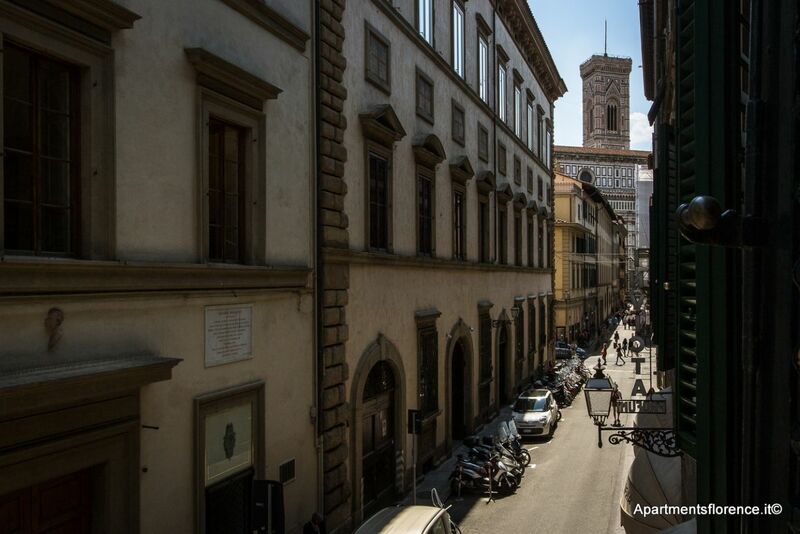 From the apartment the Duomo is literally a few steps away, while all the other attractions, such as Ponte Vecchio, the Galleria dell'Accademia, the Uffizi, Palazzo Vecchio, Santa Croce are just a short walk away; a pleasant stroll through Florence's historical neighborhoods, filled with restaurants, cafès, workshops, markets and anything you may wish for during your Florentine stay. 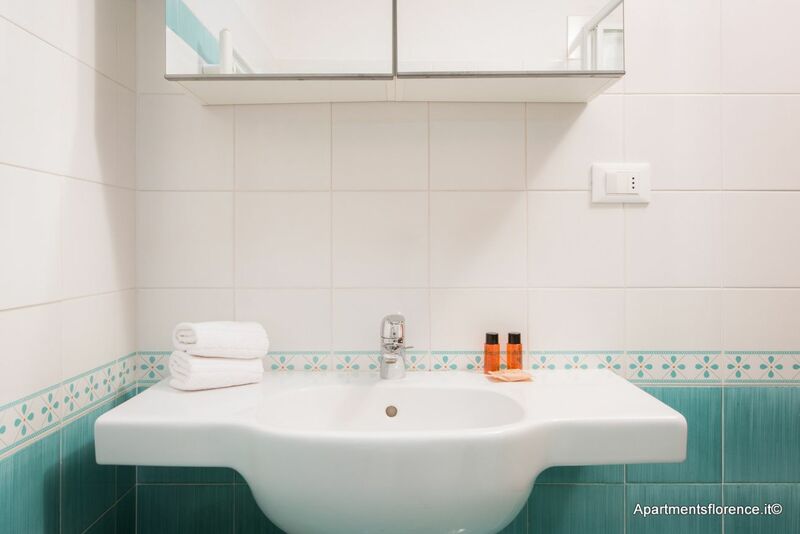 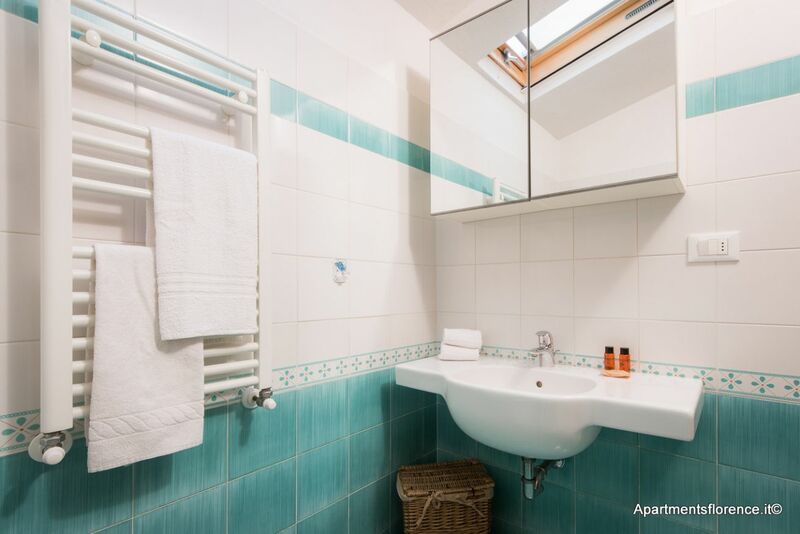 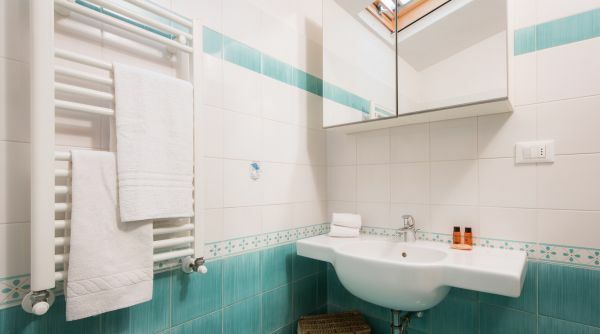 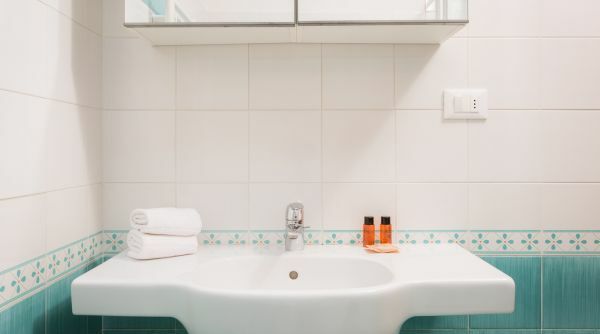 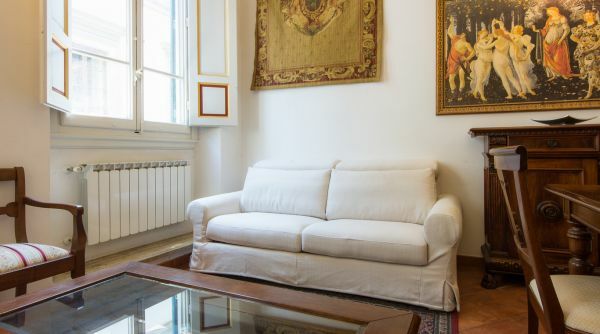 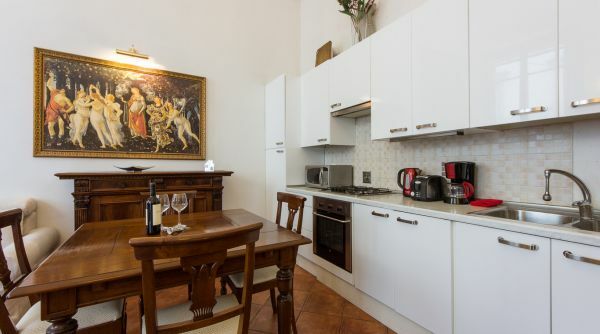 This property in downtown Florence is managed directly by Apartments Florence's qualified staff, to guarantee you the highest quality of service and assistance during your stay in Florence. 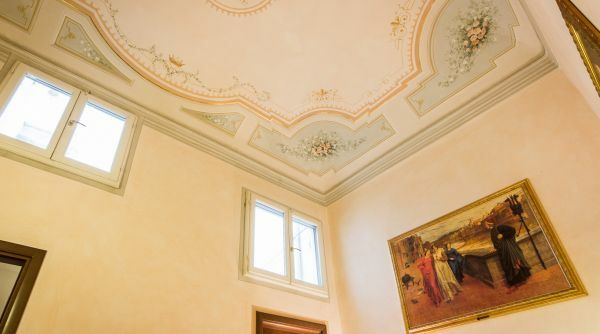 The apartment was beautiful with the painted ceiling,gorgeous artwork and attention to all the details. 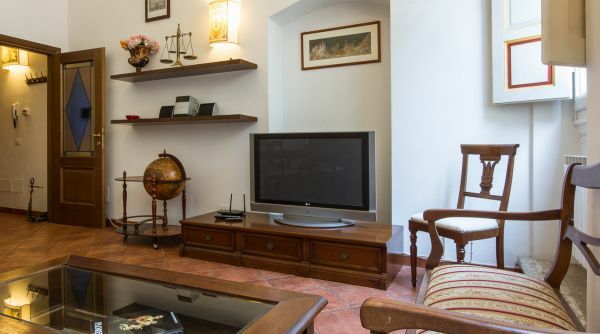 They even had a HDMI cable so we were able to hook our computer to the TV. 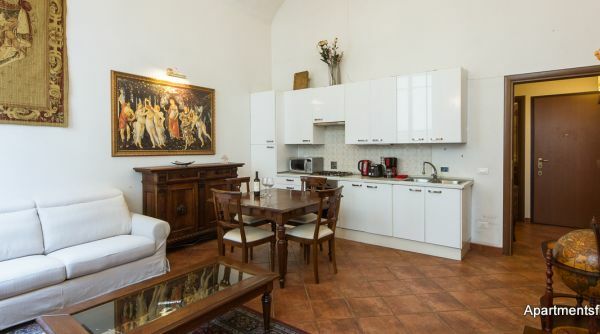 It was very centrally located to all the sites. 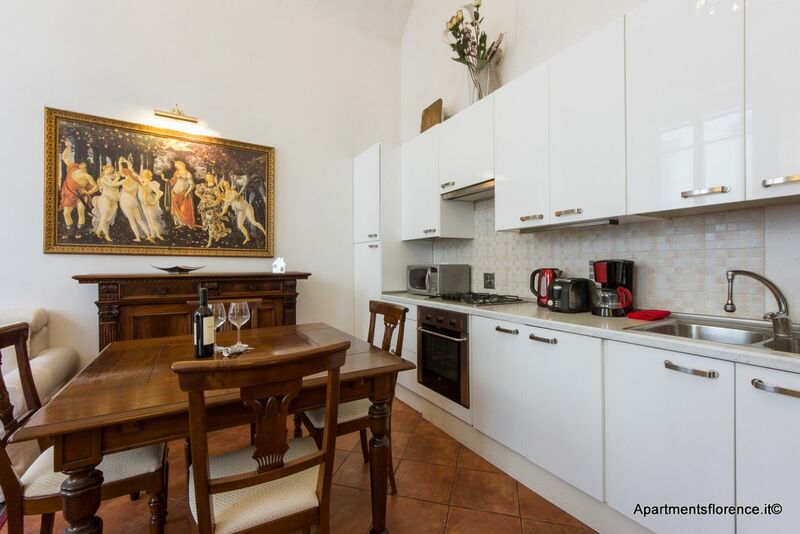 The owners were very responsive and check in and check out was very convenient. 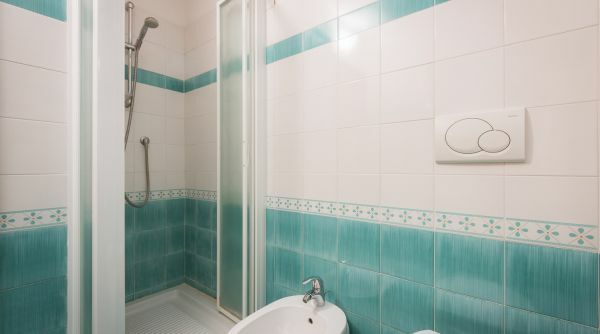 The only negatives were that the apartment had some mold in the bathroom, probably because of the humidity of the area. 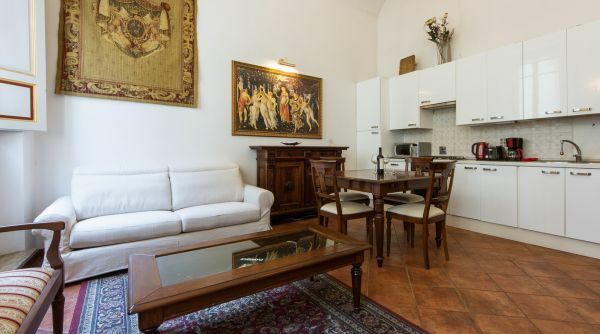 Overall, though a wonderful stay and I would highly recommend this apartment. 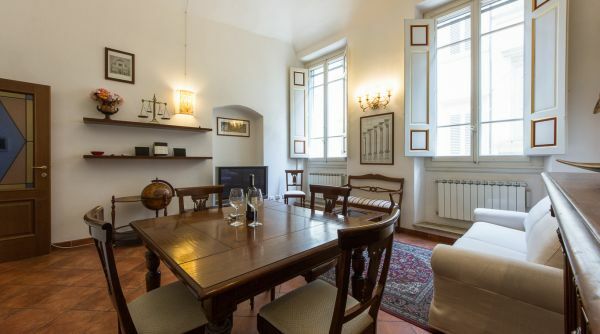 My spouse and I visited Florence for a family emergency and were lucky enough to find this excellent apartment in the historical center. 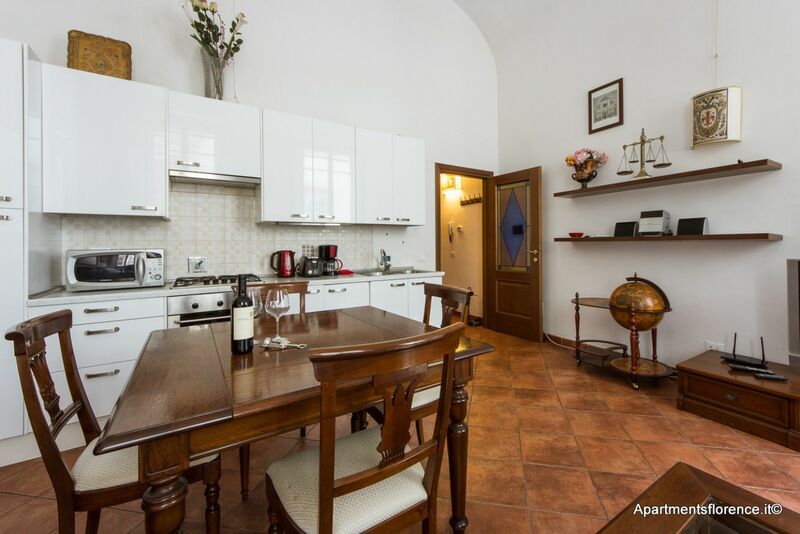 It is spacious, beautifully decorated and just like home. 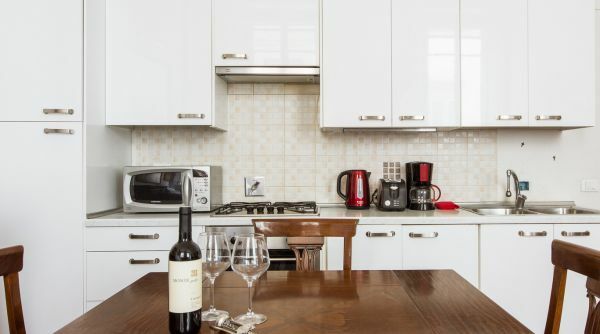 We were able to use the fully equipped kitchen to host family several times; it's not far from the Central Market and several nearby chain grocers. 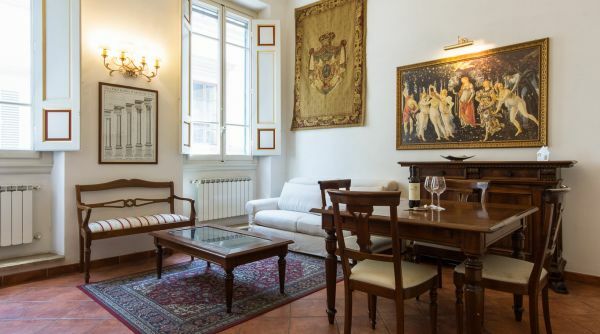 The central location is steps from the Duomo and, just beyond that, the Arno and the other side of the river including the Pitti Palace and Boboli Gardens. 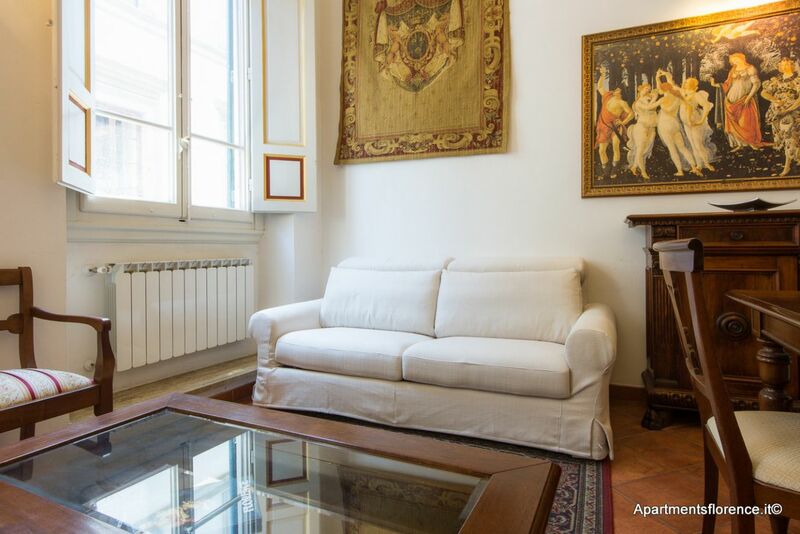 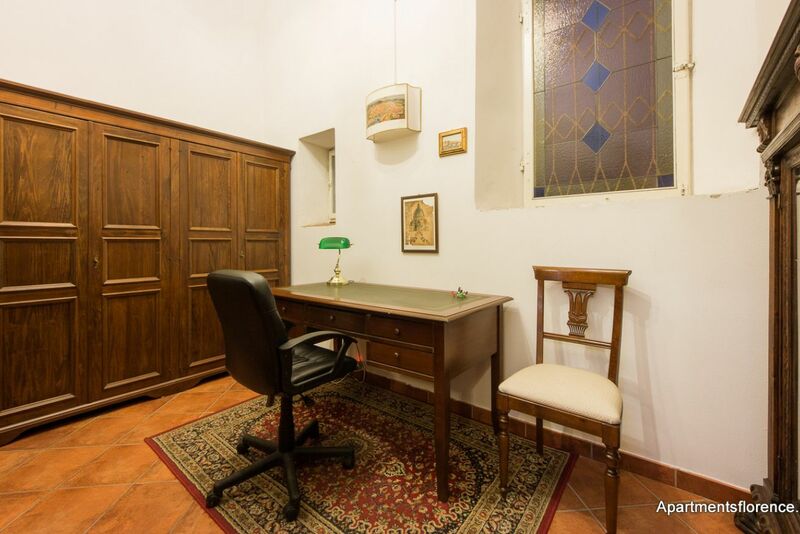 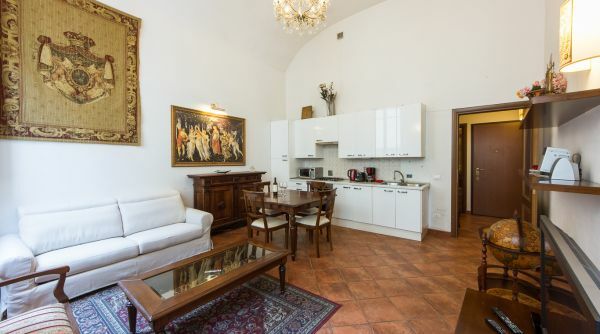 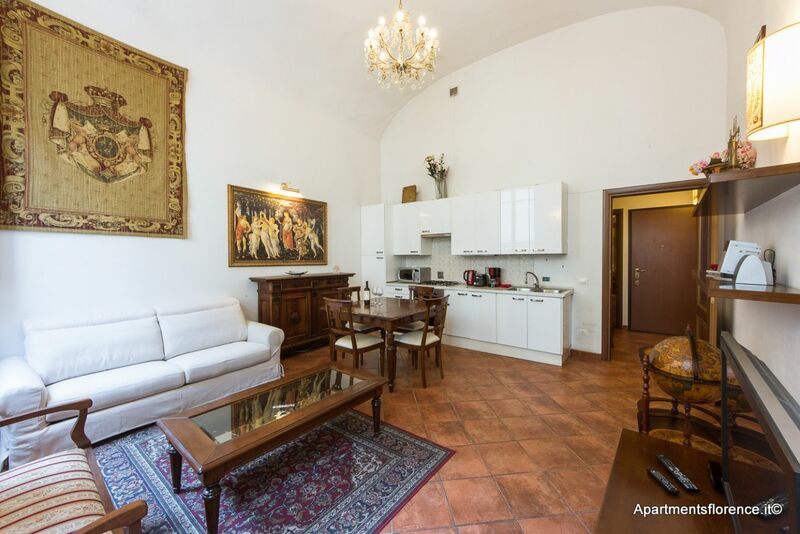 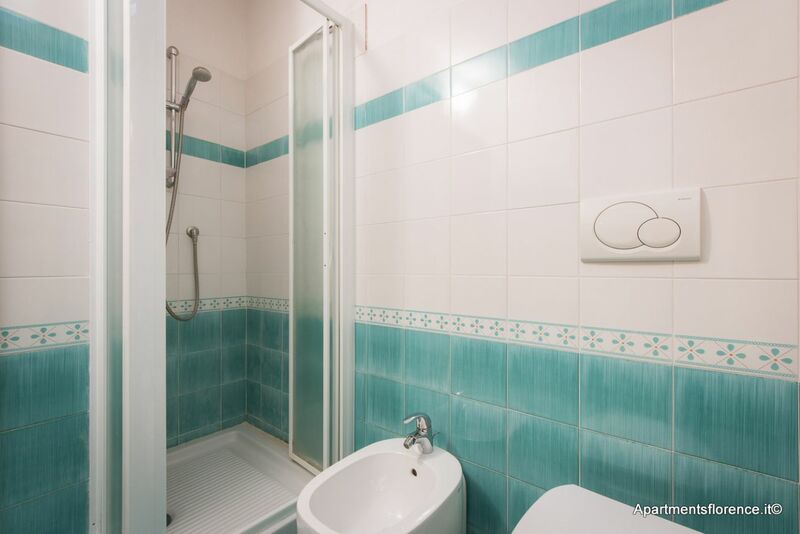 This well maintained apartment is quiet despite its location on a busy street, the Accademia with David at one end and the Duomo at the other. 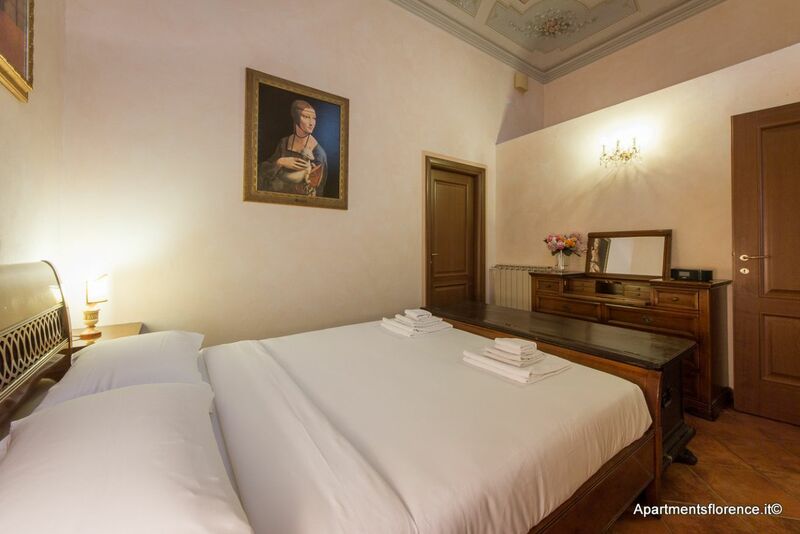 The billing for electricity is unusual: on stays less than 7 days electricity is included, over 7 days, the renter pays for the entire stay. 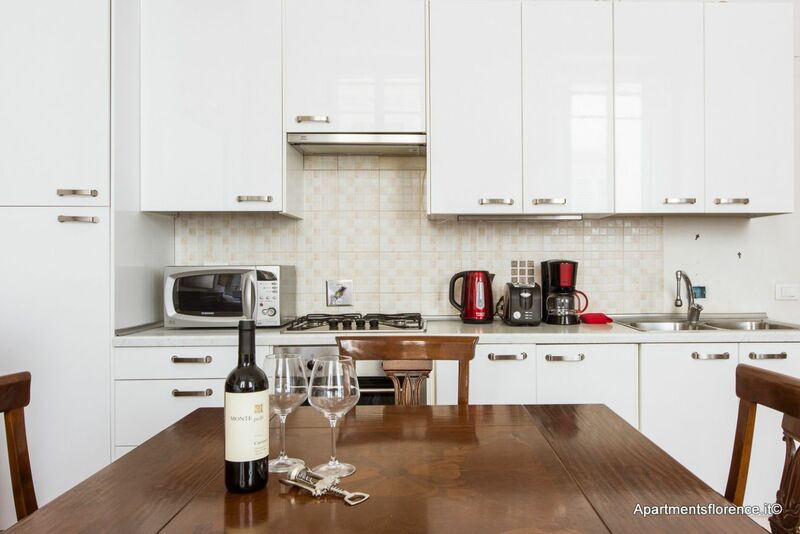 Better that the rate include electricity and gas for the first 7 days and the renter for the remainder above that. 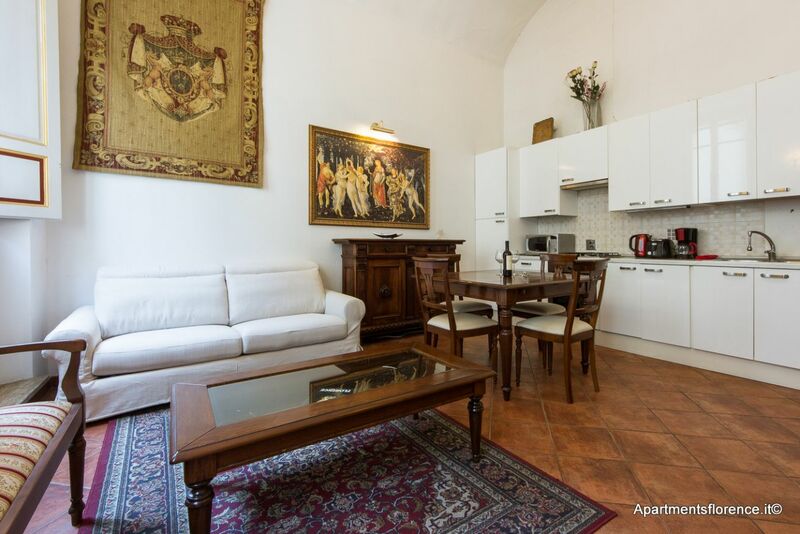 That said, this is an excellent, well located, beautiful apartment and we hope to stay there again.